On March 8th, 1,000 Dreams Fund celebrated International Women’s Day by joining forces with HARMAN, a wholly owned subsidiary of Samsung and leader in consumer electronics and connected technologies for the home, office, and car, to kick off our second annual New Face of Tech (#NewFaceofTech) Challenge. Our goal this year? To find and fund the most inspiring young women pursuing BIG dreams in STEAM (Science, Technology, Engineering, Arts and Math) today. (Notice how we included ARTS this year?) And wow, did we reach our goal! We received over 200 entries from young women across the country from future engineers to AI experts to museum curators. Thanks to everyone who took our challenge – you truly are the New Face of Tech! After a week-long public vote and thousands of votes cast, we are THRILLED to announce our 5 Grand Prize Winners. These young women will win $2,000 towards their STEAM dream and the chance to be coached by a HARMAN executive. Congratulations to our winners and shout-outs to everyone living out their STEAM dreams – don’t let anyone stop you! 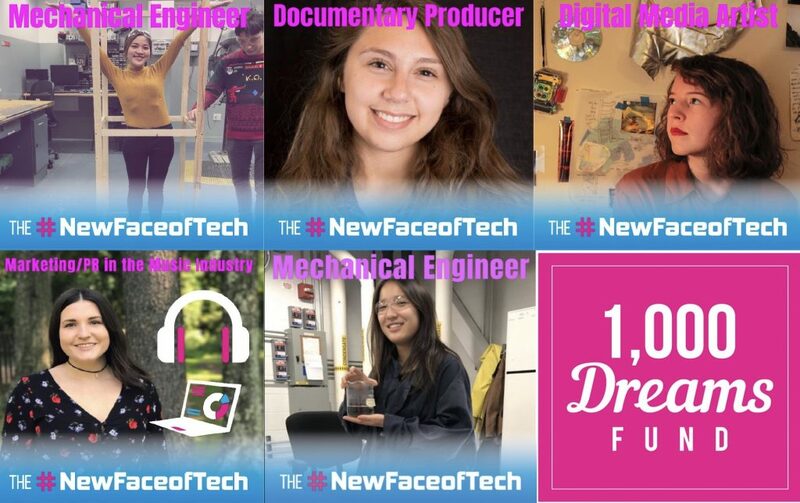 From everyone at 1,000 Dreams Fund and HARMAN: Thank you for participating in our 2018 #NewFaceofTech Challenge!